A few years ago I did a portrait of a large family group and made a canvas print that hangs over my client's fireplace. I later saw my client at an event and I asked her if she still liked the portrait I did. She said - "Yes, in fact it is the most valuable thing I own. If the house was burning down, after my kids and pets, it would be the first thing I'd grab." This is one reason I love to do portraits. I have a wonderful, air-conditioned studio here in Melrose with professional lighting, cameras, a proof viewing area, large-format printers, and the ability to do truely custom prints (I don't send my work out) on stretched canvas or fine art papers. I'm also an excellent retoucher and can pretty faces without overdoing it. In addition, I frequently shoot at any location. There are portrait samples in the gallery section of this site. Please contact me if you'd like me to photograph your family, student, child or pet. If you are an artist, museum, gallery, individual or family with old or new paintings that need to get reproduced on fine art paper or stretched canvas, please visit my Artopia Giclée Fine Art Reproduction and Photography of Art website. Or you can view samples of my jewelry, crafts, sculpture and crafts photography on this site and contact me for a quote. I also create books for artists, retouch old photographs and have an online gallery which you can see on my Artopia Giclée website. I am happily married, have two lovely teenage daughters, and walk/hike/cross-country ski or snow shoe three to five miles a day with my dog Danny, a wonderful mutt we adopted a few years back. We live here in Melrose in a house about 10 minutes from the studio. I enjoy playing piano and guitar and met my wife though music. She'a a consultant at the UMass Medical School, but also teaches violin and plays in a local rock band called Jablantos. If you need more information I can be reached at 781-665-1122. Also, my Hungarian last name is pronounced JURY-NA. 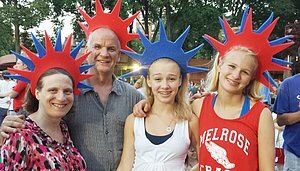 That's me and my family below on the Fourth of July at the Hatch Shell in Boston. Thanks for visiting.